An Applied Arts Scotland event in association with Interface. We are all keen to increase our environmental responsibility so we’ve invited a group of makers, academics and businesses to come and share their investigations and creations of more sustainable materials. Dr Sandra Wilson (contemporary jeweller, silversmith, researcher and educator at Duncan of Jordanstone College of Art & Design) will discuss her research with the Love Chemistry group at University of Edinburgh into recovering precious metals such as gold and copper from electronic waste for use in her jewellery practice. Dr Sam Vettese (Maker, Lecturer and Reader in Applied Art and Design at Edinburgh Napier University) will tell us about the use of waste fibres being combined with PLA plastic to create a new mixed material for 3D printing and laser cutting and the potential applications that could have. Cellucomp, a Fife based producer of innovative materials made from the waste of root vegetables will inform us of the features and properties of their Curran® materials and another new material they are creating with Edinburgh Napier University. 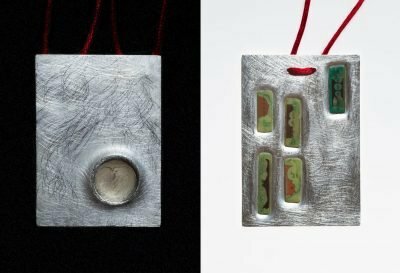 To finish ceramicist Lorna Fraser and Fiona Pilgrim of Interface will give us an insight into a recent project they have been working on with the University of Edinburgh. Lorna will discuss her questioning of the sustainability and environmental impact of the materials she uses and how plastics could be an environmentally friendly addition within her practice. Fiona will outline the support available from Interface for such innovation projects. Throughout the session we will pause between speakers to allow time to discuss how these developments could relate to our own practice and give space to consider and imagine sustainable materials that could help in our own work. Places are limited, so book early.